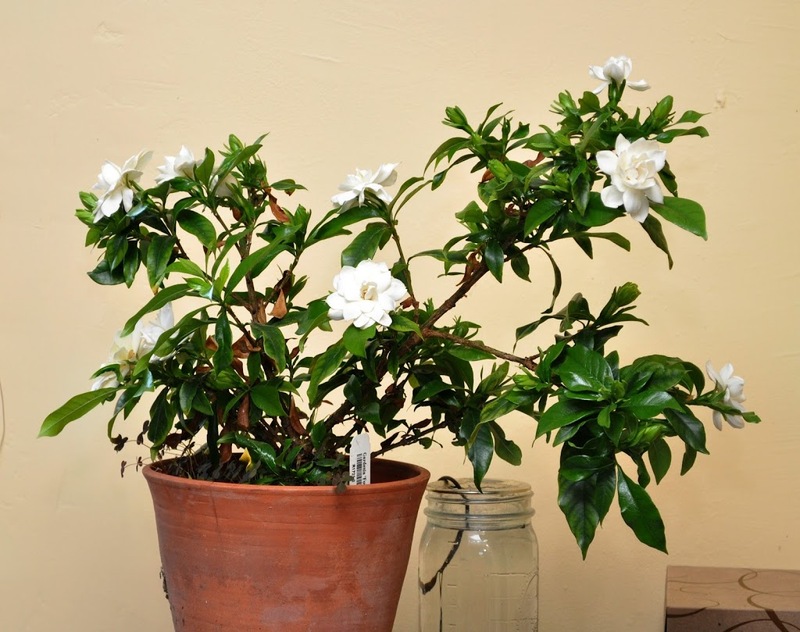 Gardenia is a temperamental plant, ready to be attacked by scale insects, ready to drop its flower buds, and ready to let its leaves yellow and drop. For the scale insects, I sprayed the plants weekly at the end of last summer with a “horticultural oil” spray before cold weather creeping onwards ushered the plant indoors. This benign spray smothers the insects. I kept the plant on a sunny shelf next to my desk where I could keep a close eye out for the insects and when they started to appear in late winter, I sprayed the plant with Safers Soap. I avoided leaf yellowing by using an acidic potting soil and with regular feeding using a water-soluble fertilizer, again beginning in late winter. Except for a few weeks of yellowing leaves, probably because the leaves were getting old (even evergreen leaves eventually get old, yellow, and drop), the leaves remained healthy and attached. I’ve never experienced drop of flower buds even though gardenias allegedly do so if moved to a different window or given any other slight change in conditions. Now is the time to get hands dirty in the garden rather than to read about gardening. Nonetheless, 3 gardening books that crossed my desk are so noteworthy that they’re worth a look even now. 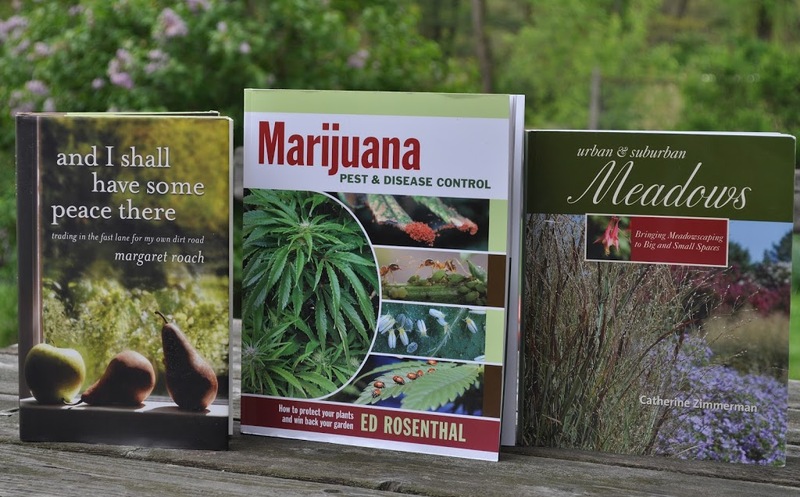 Marijuana Pest and Disease Control by Ed Rosenthal might raise a few eyebrows, but if I hadn’t already done my research and had experience with scale insects on my gardenia, Ed’s book would have been most useful. Marijuana is attacked by aphids, mold, fungus gnats — that is, by many of the same pests and diseases that attack our other plants, making Ed’s book a useful general guide to common pests and diseases. Because you don’t want to be smoking poison, the controls are organic. Moving on, everyone knows the ecological nightmare that mowing, watering and pest and weed control can make of the average lawn. One attractive way to avoid the nightmare is to make your lawn smaller and let part of it become a meadow. Imagine the crisp edge of an expanse of mown lawn rising up to a sea of wildflowers and taller growing grasses with a mown path beckoning you to come within. Catherine Zimmerman’s Urban & Suburban Meadows is one of the clearest expositions for creating a meadow. With many photos and straightforward text, she leads the reader from ground preparation to planting to maintenance, also including plant lists and sources for supplies, plants, and further information. If I didn’t already have a meadow (entered via a meandering, mown path) and didn’t already have the book, I would buy it. And finally, for a good read, there’s Margaret Roach’s And I Shall Have Some Peace There: Trading in the Fast Lane for My Own Dirt Road, a very engaging account of how Margaret traded in her job as editorial director for Martha Stewart Living Omnimedia for full-time life in her once-weekend home in rural Columbia County. The book is funny, open, and informative but, best of all, very well written. And Margaret has been a knowledgeable gardener for decades. Last night’s (April 29th) low of 26°F was, I hope the last freeze of this season. Hardy kiwi fruit vines awoke blackened and forlorn although I’m still not totally discounting the possibility of a crop from buds still to open. Many pear fruitlets are blackened within, dead. Apples look okay and, of course, pawpaws, berries, and persimmons are also okay. Vegetables are easy! Any sort of covering thrown over them provides ample protection. The last spring frost around here is, on average, shooed out the garden gate around the middle of May so I should not be surprised if another frost sneaks back in some night in the next two weeks. This entry was posted in Uncategorized and tagged Catherine Zimmerman, Ed Rosenthal, gardenia, last freeze, Margaret Roach, marijuana pest control, urban and suburban meadows. Bookmark the permalink. Trackbacks are closed, but you can post a comment. Have you ever read “Grow the Good Life” by Michele Owens? I found it quite entertaining, and encouraging for a relative newcomer to gardening. I lived in Madison many years ago, when I was an undergraduate and graduate student. (UW has an excellent horticulture and soil science department; I got graduate degrees from each.) Back in those days I would never plant out my tomatoes before the end of the 3rd week in May. And heavy frosts came as early as the 3rd week in September. Things are much balmier now. 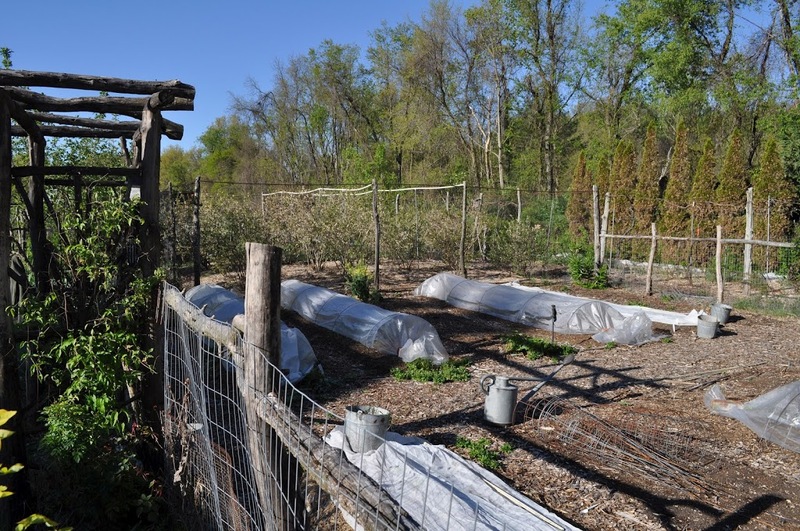 With the soil all warmed up, the blankets you have ready will keep your tomatoes warm and cozy should frost threaten. Thanks so much for the meadow book recommendation. I had been looking at a number of meadow books from the library, all of which had gorgeous pictures but either no information on how to create a meadow or very expensive techniques. I love the tiered approach in this book, and the clear and abundant illustrations.